(Tetum) Over 150 MAF-SoL staff from five districts participated in gender workshops over the last month as part of Seeds of Life’s work to ensure gender equality across its activities. 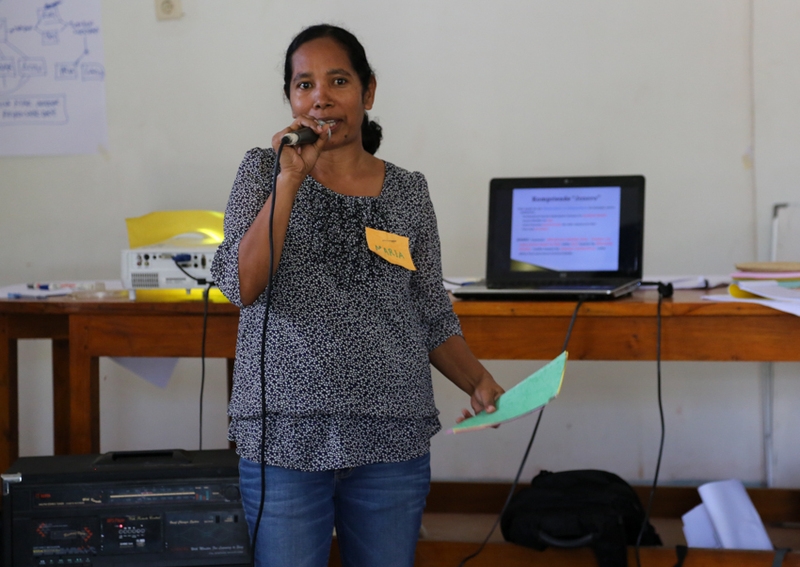 The Gender Team held workshops with 29 women and 127 men in Oecusse, Lautem, Manatuto, Dili and Aileu to help raise awareness of gender issues at the district level. Maria Fernandes, SoL Gender Team presented gender awareness to MAF staff at Lautem district. Participants discussed and learned ways to improve gender access in research and seed production activities, and spoke about creating “pilot district-level gender work plans” to ensure gender is mainstreamed into the National Seed System for Released Varieties. Feedback from participants in the Lautem workshop on 29 October shows they found the content to be useful and directly applicable to their work. Paulino Mendonca, one of the participants on Gender workshop presented the result of the group discussion held at STVJ, Dili. MAF-SoL Gender Consultant Julie Imron, who helped the Gender Team run the workshops, said the participants were very interested in the content despite it being a sensitive issue. “Our objective was really to have everyone discuss these issues in depth and give their personal opinions. “Gender is a sensitive issue because people think you want to change their family structure or habits. “Often, it is more balanced in the workplace, but it is another story at home,” she said. The Gender Team will continue to run gender awareness workshops for staff from each MAF-SoL component, for SEOs in each district and also for selected CSPGs. Gender awareness refresher trainings are also planned for 2014.